I guess it’s only appropriate that one of my favorite artists enjoyed music and dance, and was dubbed an “old curmudgeon” later in life by George Moore, writer and dabbler in la vie Boheme. Like one of his most legendary contemporaries – Henri de Toulouse-Lautrec – he painted what he saw, in snapshot form, capturing a single moment in time as it happened, no matter the subject. His ability to crop images and portray movement with such purpose inspires. 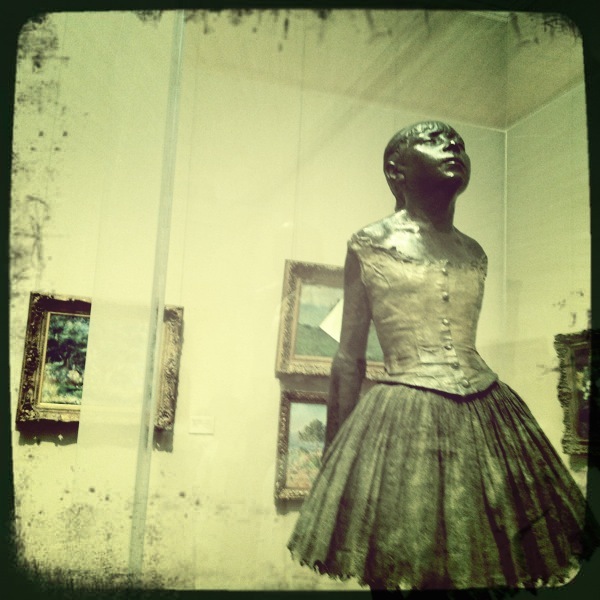 Below is a bronze cast (with satin & gauze) of one of my favorite sculptures: “Little Fourteen-Year-Old Dancer,” aka “La petite danseuse de quatorze ans.” The 3-foot girl was originally executed in wax and cloth circa (1878-82), this is one of 28 editions cast in bronze between 1920-23 after Degas died. Complete information regarding this piece of art can be found at the Boston Museum of Fine Art. The full background on the original version on view in the Mellon Collection at the National Gallery of Art in Washington, D.C. is located here. Bloomberg News reported in February 2009 that one of the bronze casts sold for a record-breaking 13.3 million pounds ($19.2 million) at Sotheby’s London. In comparison, another version sold $12.3 million at Sotheby’s New York in 1999. 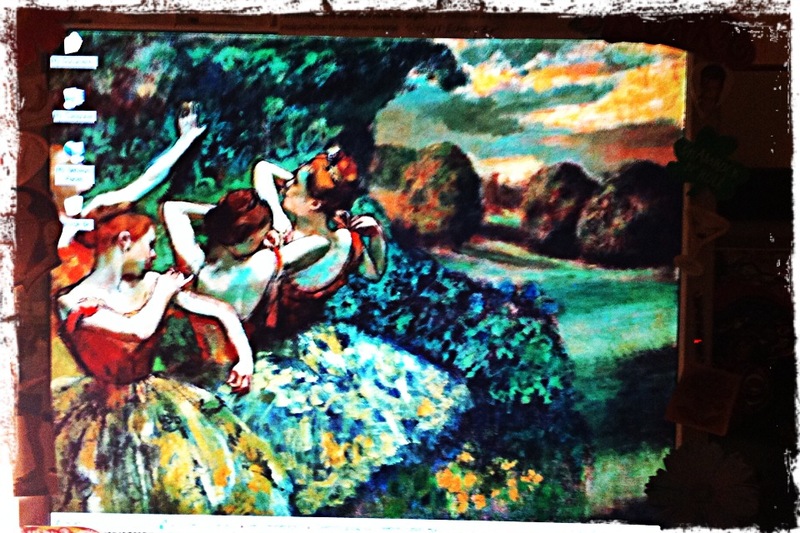 My other favorite piece by Degas is “Four Dresses,” oil on canvas, circus 1899. The original painting is also on view at the National Gallery of Art, but part of a different collection of Chester Dale’s. There isn’t a better artist representation of myself that I could ever envision, which is why I simply had to acquire it (which is bizarre, since I have never met McCullough) from the Zenith Gallery. It personifies me in every manner and sits in a place of prominence at my home. 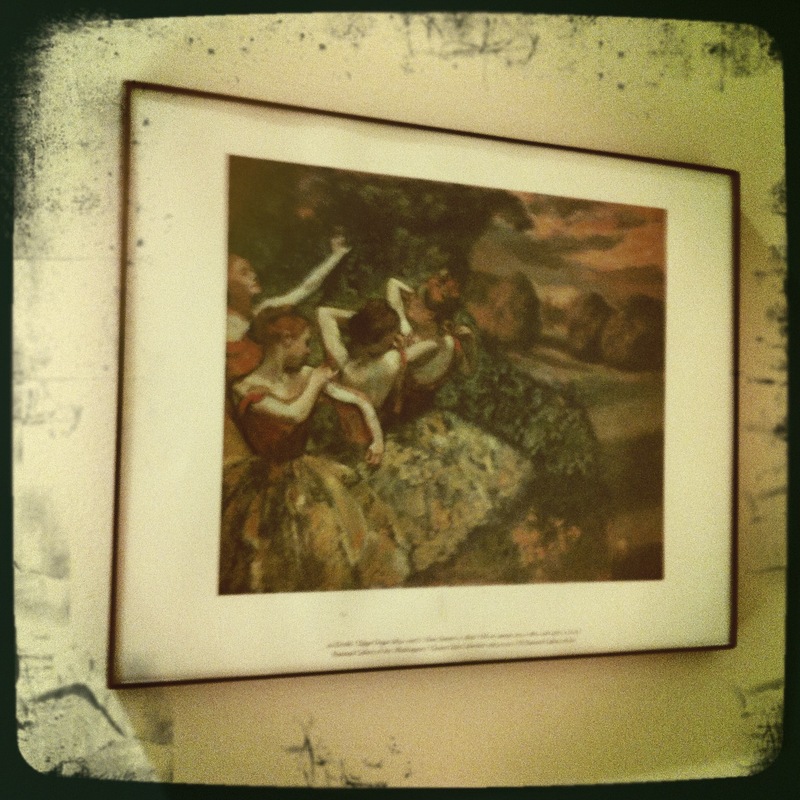 I love Degas dancer and was indeed inspired by his work. Good site! I really love how its easy to browse. RSS which should do! Have a great day and plz excuse my bad english!